Consumers can now receive cash or credits for recycling their unwanted gadgets, including mobile phones, MP3 players and other consumer electronics using new automated ecoATM eCycling stations. The award-winning eCycling booth is found at various locations across California, USA, and was demonstrated earlier this month at the International Consumer Electronics Show (CES) at Las Vegas. The innovative recycling kiosk, made by San Diego company ecoATM, was displayed in the Grand Lobby of the Las Vegas Convention Centre, where CES was held, along with the World Trade Centre, Las Vegas Hilton and The Venetian. Tom Tullie, CEO and Chairman of ecoATM, says, "At CES, we'll be demonstrating the capabilities of our latest generation of recycling kiosks to retailers, consumers, device manufacturers, and government officials who are interested in seeing how innovations in technology are being harnessed to solve a serious environmental problem. "Almost everyone has a collection of used portable electronics stored somewhere. At ecoATM, we believe strongly in repurposing good electronics that can be refurbished and used by consumers in other markets. 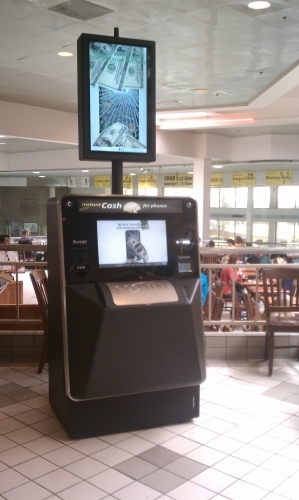 "We find a second life for about 75 percent of the used devices we collect at the kiosks. For the other 25 percent of devices that are truly at their end of life, we work with either R2-certified or BAN-certified recyclers who reclaim the raw materials and precious metals in an environmentally responsible way." The eCycle uses artificial intelligence and innovative electronic diagnostics to test and recycle mobile phones and MP3 players. It features a built-in dispenser to pay cash and also offers store credits. It will also be possible to recycle electronic tablet PCs via the eCycle kiosks. The booth has received many awards and has been tipped by the United Nation's Low Carbon Leadership program as a leading idea for global reduction of carbon dioxide emissions and has also passed Responsible Recycling (R2) regulations and ISO14011 certification. Americans buy around 500 million new electronic gadgets annually, says the Consumer Electronics Association. The average household owns 26 consumer devices, many of which are unused, even though the majority is in good working condition. Tens of thousands of devices have already been collected and recycled by eCycling stationS and ecoATM believes it is the ultimate recycling service, thanks to its convenience, immediate payment option and personal data removal facility.